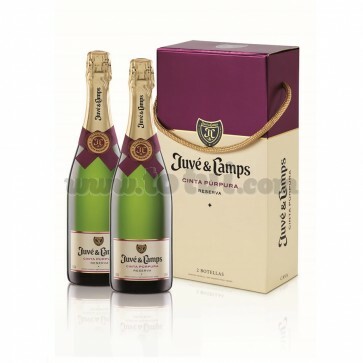 Maroon and cream cardboard box with breadcloth for 2 bottles of Juvé and Camps Brut Cinta Púrppura, a cava made with the first qualities of the must of selected grapes, of the varieties Macabeo, Xarel·lo and Parellada. Cava with a pleasant and intense aroma that evokes notes of fleshy fruit and a light floral background. The palate is pleasant, creamy and fresh. Maroon and cream cardboard box with loop for 2 bottles of Juvé and Camps Cinta Púrpura, a cava made with the first qualities of selected grapes, of the varieties Macabeo (33%), Xarel·lo (34%) and Parellada (33%), in the vineyards grown in the most qualified properties of Alt Penedés. Golden yellow color, on which stand out their fine and effervescent bubbles, which rise rhythmically, forming beautiful laces that make up a stable crown. Its aroma is pleasant and intense. At first it evokes clear notes of fleshy fruit and a light floral background. After a short time, its complexity grows and light notes of toasted bread appears. The palate is extremely pleasant. Its effervescence is vibrant and friendly, which, together with its balanced acidity, gives this cava a pleasant creaminess and freshness. Endowed with a great persistence, its aroma remains on the palate for a long time, leaving us a pleasant memory. It ages for 24 months.